Fill up on light! Try these delicious recipes with less sugar, fat and salt, inspired by the exotic Thai resort Chiva Som, temple of clean food and wellness. 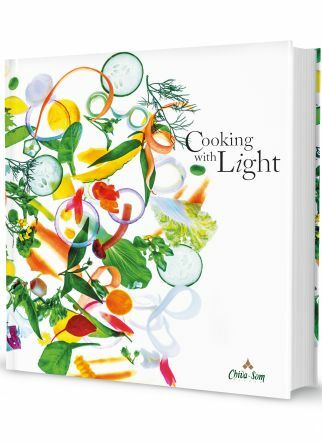 Salads, smoothies and gluten free breads, Chef Paisern shows you the way to the healthiest Thai and European cuisine in Cooking with Light, prefaced by Chef Michel Roux Sr. The iconic French marine style fashion brand Saint-James co-signs a collection with young designer Romain Brifault. Special looks for special days including a wedding dress ensemble that’s a sheath dress with a structured over-skirt. Whether it’s for the big day or not, the cape from the Saint-James autumn winter collection is a must for long winter walks on the beach… (Wool cape, 399€). The Grand Hotel in Cannes is getting a facelift! 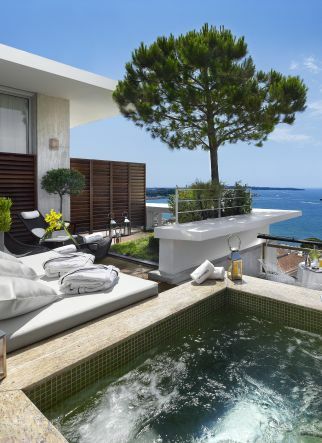 On the Croisette, the new Jacqueline suite is 90m2 of incredible sea and mountain views with a jacuzzi on the rooftop terrace for a Mediterranean dip even in wintertime! The real secret is the extraordinary garden that surrounds the hotel including 26 rare tree species. Christophe Poard, the new starred chef at the restaurant Le Park 45, uses the Brazilian guavas from the garden in his sweet concoctions and also hand picks aromatic herbs. In fact all of the orchids that are found in the 75 rooms and suites of the hotel are cultivated on site, in Deborah’s hothouse.